Just as promised, by one of the longest running and most successful action-car-movie franchises in history, we have seen the release of the official trailer for Furious 7 today, slated to hit theaters and IMAX everywhere on April 3rd 2015. This will be one of the highest grossing releases of all time for the Fast & Furious franchise, and may possibly even smash several other records. Everyone can already "feel" that it's going to be a hit, but we can show you through recent Search Trend Analysis that there is a tsunami approaching, and the swell is starting to build a Synergy Effect - This will be, Lucky Number Seven. Furious 7 Stars: Paul Walker, Vin Diesel, Jason Statham, Dwayne Johnson, Tony Jaa, Michelle Rodriguez, Jordana Brewster, Tyrese Gibson, Chris “Ludacris” Bridges, Kurt Russell, Elsa Pataky, Lucas Black, Djimon Hounsou, Ronda Rousey. By Analyzing Search Interest Trends you can get an idea of how much the court of public opinion is currently thinking about any particular subject; take Paul Walker for example, it's obvious that when news broke of his tragic death last year many people would search his name in Google - the caveat being this broad macroscopic lens wont show great details, but it can give us an idea of how people search for certain things when events happen in the world. Let's start by looking at the history of the Google Search Interests for two terms: "Fast and Furious" and "Furious 7" in the chart below. I'll begin by first pointing out the obvious, what caused those spikes? Well, it got delayed, but how big was this bad news relative to the entire franchise history? You could say Search Interest in Paul Walker's death was 7.7 times greater than the Fast and Furious franchises' biggest hit movie to date. 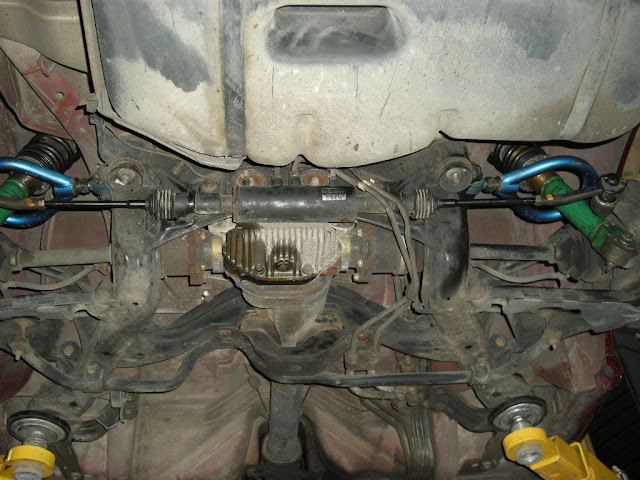 We can also extract a few other pieces of very interesting information too. First note that we have 4 previous movie releases which caused spikes in Search Interest, followed subsequently by a Normal decline over the months following the release of the movie in a very Normally distributed pattern. How-ever 7 months after the release of F'n'F 6, we see an unusual spike in Search Interest for "Fast and Furious" (which has never happened after any of the other releases). This can be associated with cross-over from correlated/compound search terms like "Paul Walker Star of Fast and Furious" etc... at the time of the accident. The normal Search Interest level for that time should have been 2.5 or less, instead we find a spike to 11, just 2 points under their best movie release. This means that a rise in Search Interest in Paul Walker could be associated with a 4.4x increase above historically normal Search Interest levels. So what does that mean for the upcoming release of Furious 7? To understand how everything ties together and how Paul Walkers death will affect the success of Furious 7, we can look at the relationship between the three Search Interest terms: "Fast and Furious", "Paul Walker" and "Furious 7". Right away there are some very strong and obvious things happening here, all three have made sudden jumps upwards today on the release of this Official Trailer - these terms are being used closely together. As well as the fact that in the past 6 months, Search Interest in Paul Walker has been basically equal to the Franchise Series, the two lines follow closely. Okay, so why are we interested in the Search Interest numbers for "Fast and Furious" over the past 10 years? Because we can use those to try and predict the World Wide Gross Box Office Revenue ($) for Furious 7. 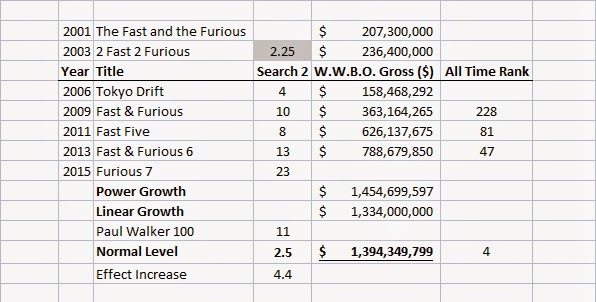 The Official SkyLife Prediction of World Wide Box Office Gross Revenue ($) for Furious 7 = $1,394,349,799 ($1.4 Billion) - which would make this the highest grossing film in the franchise, and the 4th highest W.W.B.O. Grossing film of all time - just behind Avatar, Titanic and The Avenegers. 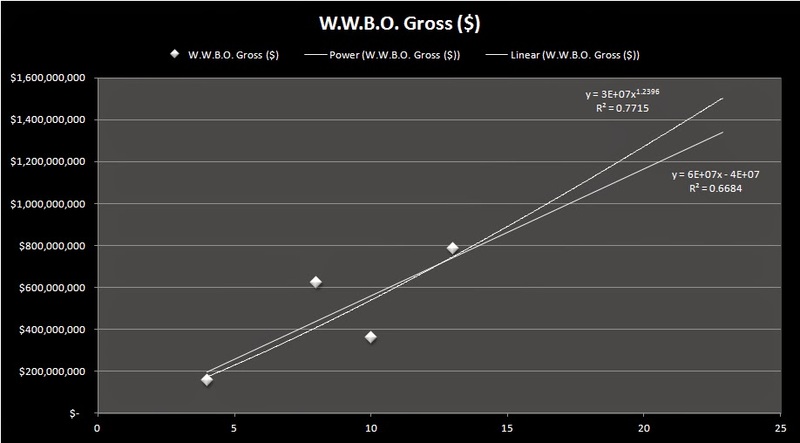 This figure came about by constructing a scatter plot between Search Interest Rank (SIR) and World Wide Box Office Gross ($) historical sales data (from BoxOfficeMojo), using the 4 previous movie releases as data points and applying both, Linear (R-squared = 0.67) and Power function (R-squared = 0.77) trend-lines to the data, we can see a positive correlation between SIR and WWBOR($). It's clear (and logical) that the more people are searching for the movie around the time of release, the more money that movie will make. That's a pretty reasonable correlation in the real world too. We can also see that over time, on average the SIR has generally increased each time one of these movies was released - IE "the power of the sequel to leverage the prequel", starting with the lowest Tokyo Drift in 2006 at SIR = 4, and the most recent release Fast & Furious 6 from 2013 with the highest SIR = 13. This gives us an average increase of 2.25 SIR points per movie release over the past decade. It's not very likely that we would see diminishing returns on this effect for Furious 7, especially given the circumstances. So, logically following the same trend we might expect Furious 7 to have an SIR = 15.25 around release time. How-ever, recall that we calculated the effect of Paul Walkers death having on SIR to be 4.4x the normal rate, so applying this same factor to our normally expected growth rate means we now might expect Furious 7 to have an SIR = 23 around release time. (4.4 x 2.25 = 9.9 + 13 = 23). Now, since this is just an estimate and the data-set we used was relatively small, with only 4 points to apply our function to, we can take the average of the two results in an effort to be reasonable with our margins of error, even though the Power Function did have a greater R-squared value, it could still be a linear pattern if we had many more points to analyze. 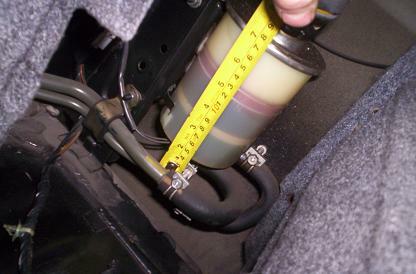 With any estimate, more historical data would increase accuracy. At the end of any analysis, the single most important question will always be, "Is this result reasonable?". So we ask ourselves, do we believe that, given the effect of Paul Walker's death on the Search Interest around the release of Furious 7, this movie will be more successful than Harry Potter and the Deathly Hallows part 2?... The fans will answer that on April 3, 2015 - But we certainly hope so! If you're bored with all these numbers, give your brain a rest and enjoy this video called "Furious 7 Retrospective - The Road to Fast & Furious"